On yesterday’s post, a reader (well, okay… my sister. 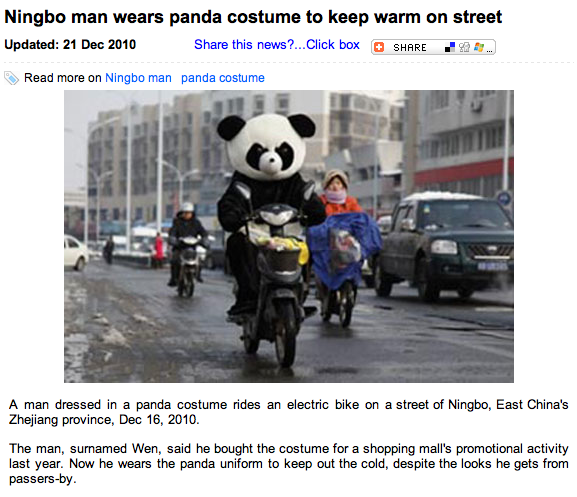 But I say “a reader,” it creates the illusion that I have a readership out there) suggested that cyclists could just wear cute and cuddly animal costumes. Who would care if they got hit by a panda? Pandas are cute as hell. Screw you, fancy-pants Amsterdam winter cyclists. 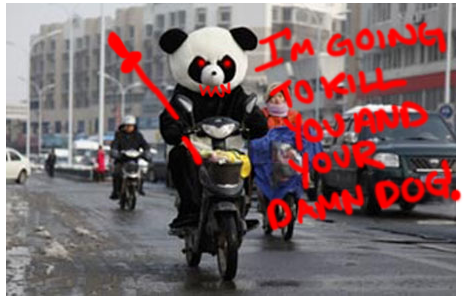 Ima wear me some panda suit. Yep. That's also a bike. The province decided two years ago that electric bikes should be governed by the same rules as regular bicycles. That decision changed the implications of at least one bylaw. Bicycles with a wheel diameter of more than 61 centimetres cannot go on Toronto sidewalks, but smaller ones can. 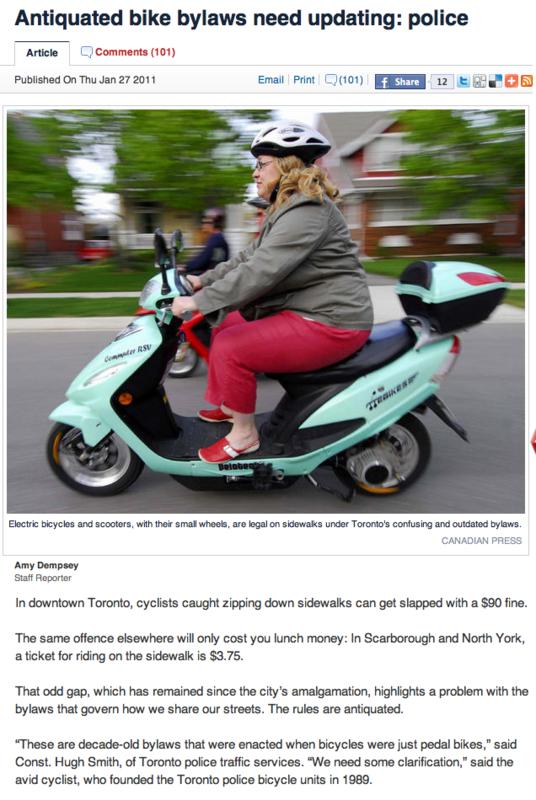 Since Vespa-style electric bikes or scooters are built with smaller wheels, the outdated bylaw allows some e-bikers to legally use sidewalks. As it stands, bicycles are legally obligated to stay off the sidewalk. E-bikes, on the other hand, are not only allowed to occupy large amounts of space in a bike lane and then proceed to travel slower than an actual bicycle, have free rein to stealthily roam the sidewalks as they see fit, taking out nuns and dog-walkers as they see fit. That's supposed to be a spear, if you couldn't tell. Actually, I’m not sure if those wheels are less than 61 cm in diameter. But if they were, watch out. The Globe and Mail learns that it takes more than a photograph to cure health problems. “The headless stomach” is how Rebecca Puhl, the director of research at the Rudd Center for Food Policy and Obesity at Yale University in New Haven, Conn., describes the phenomenon. There is no doubt that the media portrayal of people who are obese – it ranges from sneering to pitying in everything from TV sitcoms to daily newspapers – is quite negative. Instead, like how we half-heartedly encourage cyclists to get off the @$%^#$@ sidewalk (we’ll give you a few separated bike lanes, and in return you’ll continue to let us run you down with a Lincoln Navigator. We cool? 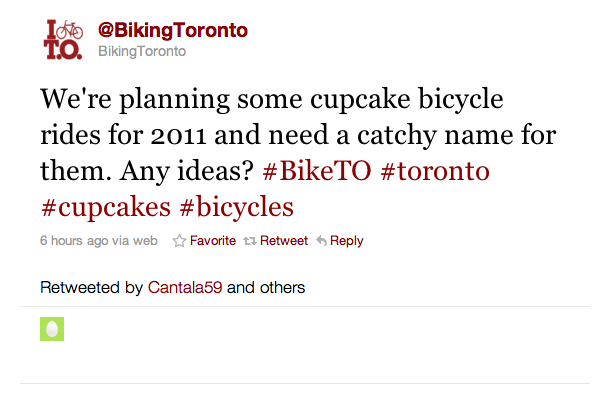 We cool), we can insensitively lure the morbidly obese onto bikes the same we do with women: cupcakes! Now, every good scientist knows that absolute numbers aren’t necessarily the best metric to use. I mean, no hipster would ever admit to being a hipster, after all, so those numbers are naturally going to be low. So, proportions are the way to go here. This highly scientific study shows us that while 12% of hipsters like cupcakes, a full 72% of cyclists like cupcakes! 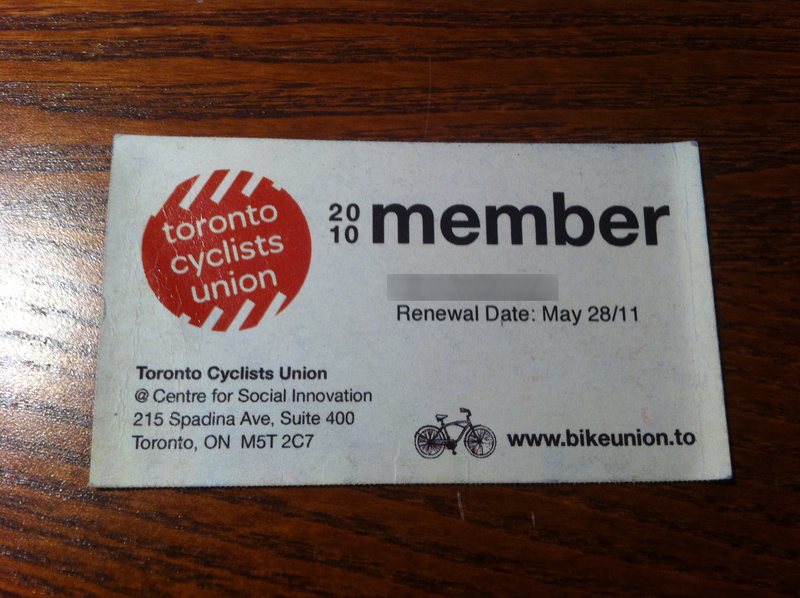 Really, I’m in danger of losing my cyclist card. 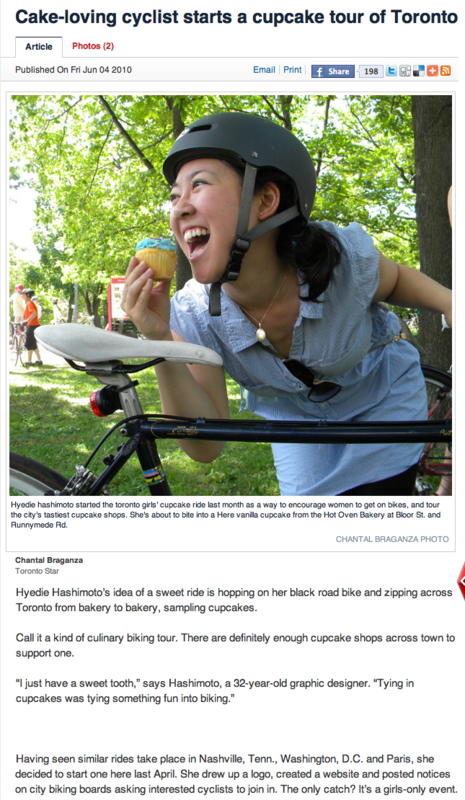 And how am I ever going to learn how to love cupcakes if I can’t get invited on these ladies-only cupcake bike tours? I mean, based on my other exhaustive research, there are clearly a lot of men who like to ride their bikes and eat their pink-frosted miniature cake products, too. I also don’t think my suggestion for a name will work out. But at least I’m trying. This entry was posted in BikeTO and tagged bike lanes, bikeTO, cupcakes, e-bikes, hipsters, obesity, pandas, pseudoscience, Sidewalks. Bookmark the permalink. 1 Response to Screw bike lanes, let them eat cupcakes! Giggle. Panda suit. Can’t believe that is something.